I consider myself incredibly blessed that author Sylvain Reynard wrote this beautiful piece on faith and art for my blog. Reynard is the bestselling author of the Gabriel’s Inferno Series and the Florentine Series. The next installment of the Florentine Series, The Shadow, is due in February 2016. In my novels, I explore the theme of redemption, along with the themes of faith, hope, and love. The characters themselves have varying beliefs, ranging from atheism to theism. I see each character as being on some sort of spiritual journey. In what follows, I’d like to explore the connection between art and faith. The song lyrics, (which you can read here http://www.songlyrics.com/matthew-perryman-jones/o-theo-lyrics/), are derived from letters written by Vincent van Gogh to his brother, Theo. The song expresses Vincent’s experience as he struggled to be a preacher and then left that calling. It also describes a romantic encounter and his longing for home. But there’s more to it. “Starry Night” is a painting of a skyline. It’s about a view of the sky and the stars and the buildings and trees below. But there’s more to it. I’ve chosen these two artistic works to illustrate a couple of points. 1) Good art elicits a feeling of awe and transcendence in its audience. I use “art” here to include not only the visual arts, but also the performing arts. The feeling of awe elicited by good art is similar to what the Romantic poets and thinkers identified as the Sublime. 2) Good art points to a transcendent reality that includes truth, beauty, and goodness. Not only does art elicit an experience of awe in the audience, but art also points to something beyond itself – something transcendent. 3) In my view, the transcendent reality that is truth, beauty, and goodness, is the object of faith. It’s part of the human condition to long for home, as expressed in Vincent’s words to his brother. We all long to be accepted, to love and be loved, for forgiveness, grace, and peace. We long for the sublime, the transcendent, the beautiful, and the good, even when we get so confused about the truth of those things we go searching for them in self-destructive and harmful places. But every question has an answer. Every desire has an object. And the object of our longing for home is precisely the object of faith, in my view. There’s something about art (and especially good art) that stirs these questions while also pointing to the answers. I try to express some of these ideas through my attempt at art, which is writing novels. But I tend to see it most clearly in the creative efforts of others, particularly in paintings and in music. I see it in van Gogh, whose work I admire very much. What’s the piece of art or artistic expression that invokes feelings of the transcendent or the sublime in you? Cover Reveal! 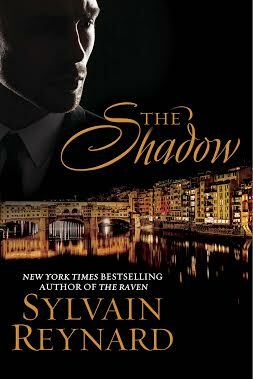 The Shadow, Sylvain Reynard’s sequel to The Raven! It’s here! At long last we finally know the title of Sylvain Reynard’s new book! We also get a peek at the beautiful cover! The Shadow is the highly anticipated sequel to The Raven and is the second book in Reynard’s thrilling Florentine Series, due out February 2, 2016. Read on for juicy details and links to order your copy! Click below to pre-order your copy of The Shadow! Interview with Sylvain Reynard, Part 2…. I decided to publish this last segment of my interview with Sylvain Reynard after The Raven’s release. I’m not a fan of spoilers, and while I don’t think there are spoilers in this interview, I wanted fans to have a chance to meet Raven and the Prince before reading this. So read on for more juicy tidbits from Sylvain Reynard…. The novella The Prince is followed by the full-length novel The Raven, in which we meet a young woman who finds herself thrust into the Prince’s world. Raven is a very different character from Julia. Both represent the epitome of goodness, but Raven finds herself with a man who (by all admissions and appearances) embodies darkness and, perhaps, evil. How were you inspired to create her character? When I began writing The Gabriel Series, there were two scenes that dropped into my head. First, the conflict in the classroom that opens “Gabriel’s Inferno,” and the scene in the orchard, which occurs a few chapters later. When I began writing “The Raven,” the scene that entered my mind fully formed was the scene in which Raven walks home after a party. I saw what she looked like, how she walked, and her entire history. I knew she was an artist and an art restorer, and that she was extremely intelligent, compassionate, and very creative. Raven is a very intriguing character. She’s brilliant but her confidence takes a hit from the frustration she feels with her self-image and her physical limitations. The Prince can’t understand why she feels the way she does about herself or her appearance, reflecting an interesting perspective on the changing perception of beauty over the centuries. I’m sure that many readers will relate to her body image issues and appreciate that she’s not perfect. What led to that particular aspect of Raven’s character? As I mentioned, I saw her in my imagination fully formed, but I also intended her to be an atypical female lead. She doesn’t possess extraordinary physical beauty or bodily perfection and she isn’t thin. She’s an attractive woman but much of her beauty comes from her character and her actions. What’s next for the Prince and Raven? Thank you for asking. Readers will have a taste of the sequel to “The Raven” at the end of the book, because I’ve included a teaser. To purchase The Raven, click here. Many thanks again to Sylvain Reynard for taking the time to do this interview!